Once upon a time I was just another hard-working web writer trying to figure it all out. Once upon a time I was frustrated by my corporate gig. Too chicken at that point to go out on my own, and too naive to package what I did know to be able to crush it in a corporate environment. Once upon a time I was as dazed and confused as we all are when we start out. I had a lot of passion but I also had a bunch of gaps I needed to fill in. And if I had to identify any turning point, when I was able to find a bit of an “Aha” moment and start to pull it all together, it just might be the first week of May, 2008. That’s the week I attended my very first blogger’s conference — SOBCon. I had a blog (check) and I needed to know more about how to run a business (check), so it was exactly the right fit. And it was run by super-smart folks Liz Strauss and Terry Starbucker, so I knew I was going to learn a lot. I was, of course, properly star-stuck to meet Mr. Authority Blogger himself. The day before things really kicked off, he and I, along with the lovely Dawud Miracle, walked seemingly the length and breadth of Chicago to find something for lunch. (You wouldn’t really think it would take as long as it did.) I spilled my ice water all over Chris at lunch. He nonetheless was extremely kind and friendly … and the friendship that started there has resulted in lots of interesting projects together. These days, of course, we’re rowing in the same boat, which has been a tremendous pleasure. This was back when Clay was a mild-mannered blogger, not the master of the universe we know today. We made a quick video that involved a lot of swearing at a friend who couldn’t attend. Good times. To this day, Clay and I enjoy pointless Fitbit competitions over how many steps we’ve taken this week. Who is talented and beautiful and funny and amazing. And who had heard of my blog. Had even read my blog. Seriously, I came close to just leaping into the river and calling it a day. I’m so glad I made the connection, Christine. I had written a few posts for Copyblogger, but this was the first time we met face to face. He teased me about my blog being a shrine to Seth Godin, which it was, and which I have no problem with. He did not seem to think I was an idiot, which was a relief. He was extremely nice, as a matter of fact, and later that year we started working on more projects together. That’s gone well. That was five years ago, and I still remember so many moments. I go to a lot of conferences, but this one was a turning point. Partly because of the quality and heart of the people involved, and partly because the number of attendees is limited, so you can really connect with the people you meet … instead of collecting a hundred business cards from people you’ll never talk to again. SOBCon was the event where I figured out that this weird blogging and content thing was actually the heart a fantastic tribe — a tribe of people who actually got me. And I belonged there. And I could thrive there. After that point, things started to come together. Good stuff started to happen. Slowly at first, and then kind of alarmingly quickly. 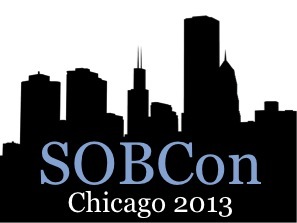 When Terry asked me to be part of SOBCon this year, I knew I had to write this post and explain to you all why it’s so dear to me. Because it’s small. Just 150 participants, so you truly can make a connection with everyone you meet there. Because it’s run by smart people who get it. Terry and Liz know this game, and they run this event as a celebration of what we do. Because it’s where you’ll find your people. People who understand why you’re so giddy when you score a sweet guest post, when you finally crack the next milestone of reader subscribers, when you hit 500 tweets on a post. Trust me, normal people don’t get you. This is a lovely way to find people who do. Important: You want to use that code before March 1 to get the best price — an early registration discount plus the discount from the coupon. And if you do decide to join us, will you let me know by dropping me a note on Twitter or Google+? It would be my pleasure to make a connection with you. SOBCon keeps the conference great by keeping it small … which means the number of places is limited. If you’re going to join us, go take care of it now. Register for the event here, and don’t forget your discount code … it’s sob100. Sign up before March 1 to get the best price!